Two stage queue boxes are an area designated to hold a queue of people waiting to finish two stage turn manuever. 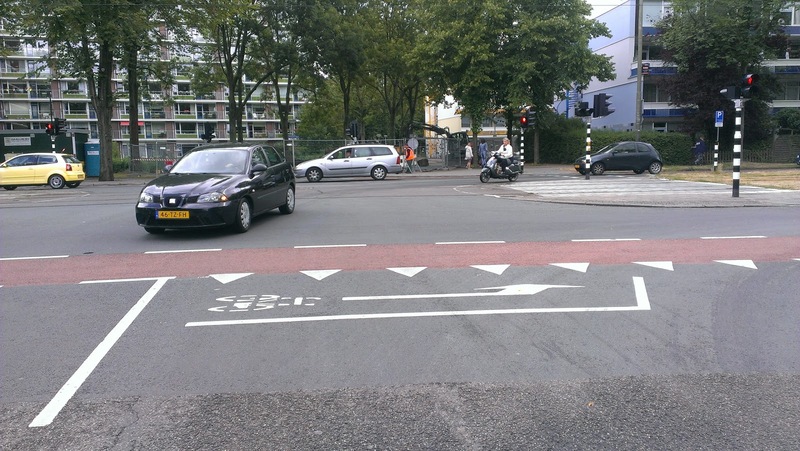 To use this design, a person would remain in the bike lane and veer right, turning their bike to orient towards making the turn. 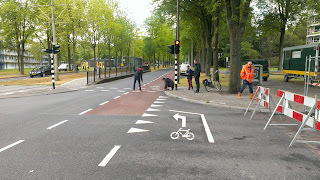 Two stage queue boxes are not used very often in the Netherlands due to the nature of how many cycletracks they have throughout the country. During our study of traditional bike lanes used in the City of Delft, we found this intersection where the left turns at the traffic signals is made from the left turn lane shared with cars. 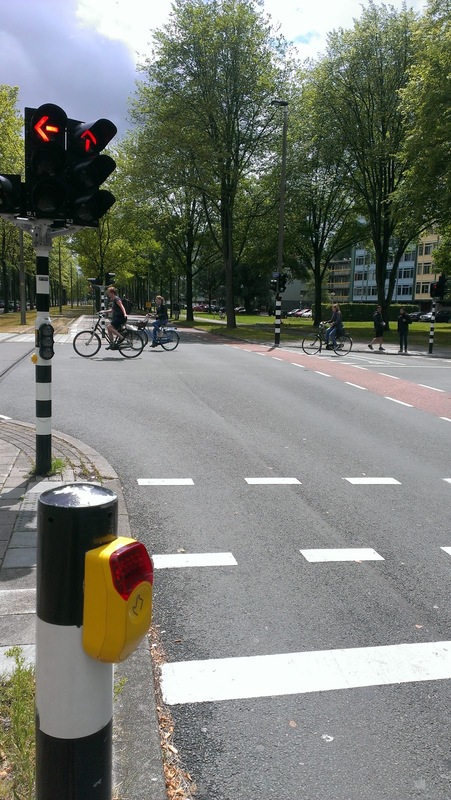 The detection of the people on bicycles is done with a conveniently placed push button adjacent to the curb. There is the maintenance concern with a pole placed that close to the curb, but that short pole with the button is before the curve, so with a low volume left it may not be a problem. I am not clear why they felt the need for a button as opposed to having an inductive loop detector, which is used throughout the City in other places. The other element of the traffic signal in this particular location was that they have a nearside signal head for both the vehicles and the cars. It is a supplemental head mounted adjacent to the pedestrian push button. 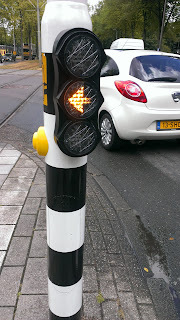 This traffic signal pole is used for the supplemental nearside left turn signal indication, the pedestrian push button and both vehicle signals (larger displays). The other option presented for the left turning person on a bicycle is the two stage queue box. 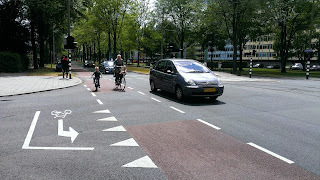 The picture here shows a younger person with an adult who might not want to weave across the through lane to get to the left turn lane. 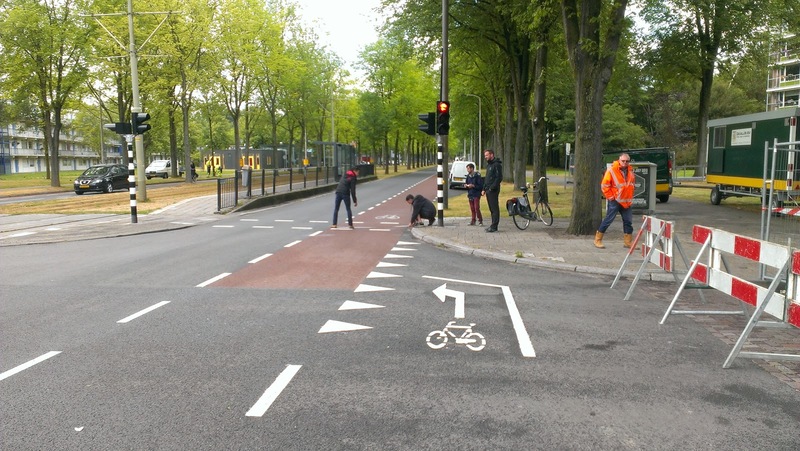 This two stage queue box offers an opportunity to remain in the bike lane and make what we often call the "Copenhagen left" because this treatment is often used there. 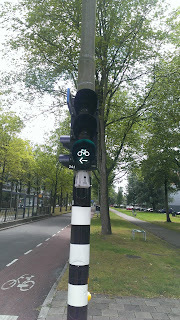 The farside traffic signal provides an arrow underneath a bicycle symbol to clariy what the person on a bicycle should do upon getting the green. 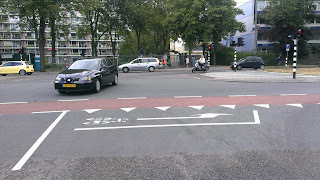 The left turn queue box is staged in front of the side street through and left turn movement in effect blocking that movement so that the person on the bike can be at the front of the queueand not incur delay . It operates like a bike box without the lead in lane. This is similar to Broadway to Williams, yeah?